Another take-out fake out favorite for you guys today! Mongolian beef is one of my favorite things on a Chinese menu, but I usually don’t order it because the beef is so tough and fatty. By making it at home you can choose the cut of beef that you want, ensuring a lean and tender bite. In this case I used a sirloin that I cut down into thin strips. A quick stir fry with some garlic, ginger, and a quick sauce made up from things in the pantry. 10 minutes from start to finish! I served on a bed of white rice with some steamed broccoli on the side. I really don’t think you could order out as quickly as you can have this on the table. And, it’s much better for your family, obviously. We love our fake-out take out nights around here! Heat the oil in a pan over medium-high heat, add the beef and saute until nicely browned, about 4 minutes. Add the garlic and ginger and stir-fry for 30 seconds more. In a liquid measuring cup mix the soy sauce, hoisin sauce, brown sugar, Sriracha, cornstarch, beef broth, and sesame oil. Pour into the pan with the beef and cook until it thickens , about 2 minutes. Remove from heat. Garnish with green onions before serving. I’ve been debating ordering Chinese for DAYYYYYS and now you go and post this. I want to make it right now. 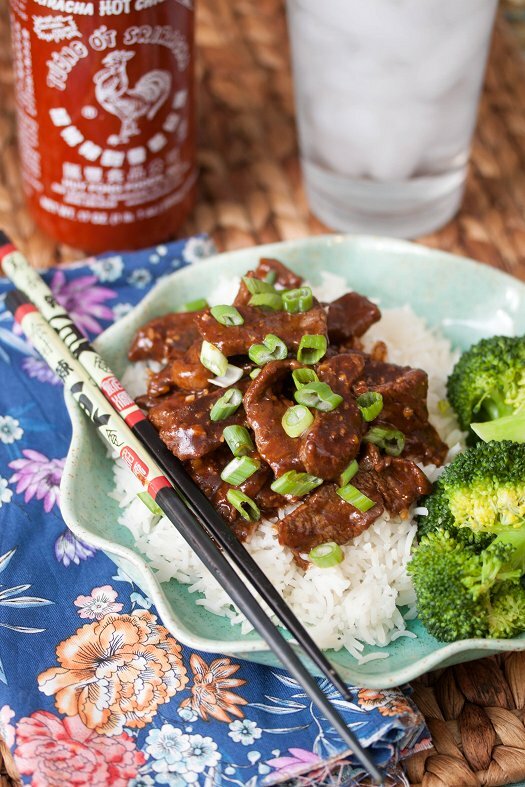 I often order Mongolian beef, but I have never even thought about trying it at home. This looks more than doable. Your picture conveys deliciousness. SO I pinned it.